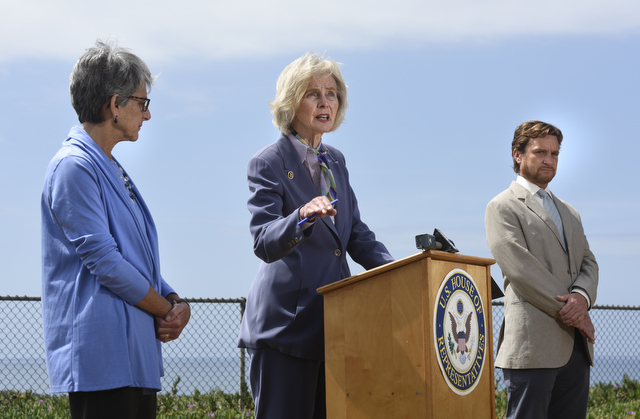 Two days after Earth Day, Representative Lois Capps spoke to reporters about her latest legislation that would temporarily halt offshore fracking pending further environmental review. The first of its kind, the measure would require regulators to study the impacts of fracking in federal waters off the West Coast and subsequently draft an environmental impact statement to offer alternatives to minimize any negative impacts. “We know very little about onshore [fracking], but we know even less about offshore fracking,” Capps said Friday morning at Shoreline Park. In 2013, environmentalists cried foul after the Environmental Defense Center (EDC) released a report titled “Dirty Water: Fracking Offshore California,” which revealed that fracking has occurred for two decades off California’s coastline. The EDC had submitted public records requests to obtain the information, and it claimed federal regulators failed to adequately oversee a number of high-intensity drilling operations. The EDC’s report was published on the heels of Governor Jerry Brown’s signing of Senate Bill 4. The state law requires environmental review of fracking, but it does not apply to operations in federal waters. Per SB 4, oil companies must also disclose what chemicals they use. State Senator Hannah-Beth Jackson, who joined Capps and Segee, spoke about her recent effort to take state regulators to task. Following reports that the Division of Oil, Gas and Geothermal Resources (DOGGR) erroneously allowed oil companies to drill into aquifers protected by federal clean water laws, Jackson sponsored a bill that calls for the agency to be more transparent. It would forbid oil operators from keeping confidential records and prohibit underground injection of wastewater into aquifers. “We are not a state that says, ‘drill, baby drill,’” Jackson said Friday. A number of Democratic congressmembers also used Earth Day to introduce eco-friendly legislation, including bills to increase renewable energy while cutting carbon pollution and to place a tax on emissions. Capps, who announced two weeks ago she would retire after her ninth term, has long supported efforts to limit oil and gas drilling on the coast.